There have been a few of decent snowfalls recently, but this week we woke up to around nine inches of the best type of snow; the fluffy, soft kind which drapes itself in drifts under the hedgerows, settles on power lines and branches, and creaks in that satisfying way when compacted. It's absolutely the right time to leave the comfort of home, and re-acquaint ourselves with the hidden world of winter. Far away from the modern world and the responsibilities it brings, we explore the woods and pathways near our home. The world is quiet, the forest is empty. Powerful and timeless, it's all for us... and us alone. Deep snowfall on soft ground replicates the easy terrain of the sandy racetracks of Demelza's past, and the feel of it under her paws must flick an instinctive switch somewhere in her brain. 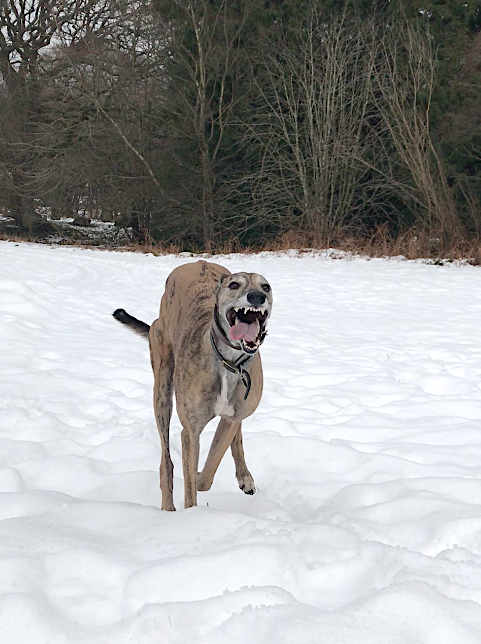 The heart and soul of a greyhound in action is indeed a splendid thing to see (please excuse the blurry shots - they're stills from video taken on my phone)! We chased each other, rolled around in the snow and shouted. We watched blackbirds flick for food in the fallen leaves, and heard the cry of buzzards somewhere overhead. We crept through dripping ferns as the snow began to thaw, watching for squirrels and deer. We follow the tracks of rabbits, and Demelza leads her small pack deep into the forest. I wear my favourite talismanic jewels of carved horn and antique claw, to accompany and protect us. As the light fades, time slows down even more. We watch the new moon appear, and the trees sigh and clack in the cold wind. We must head for home.